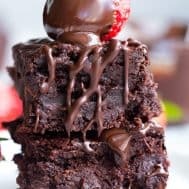 These fudgy paleo brownies are layered with easy homemade strawberry preserves and drizzled with more dark chocolate for the ultimate decadent (but healthy!) dessert. They’re grain free, dairy free, gluten free with a refined sugar free option. 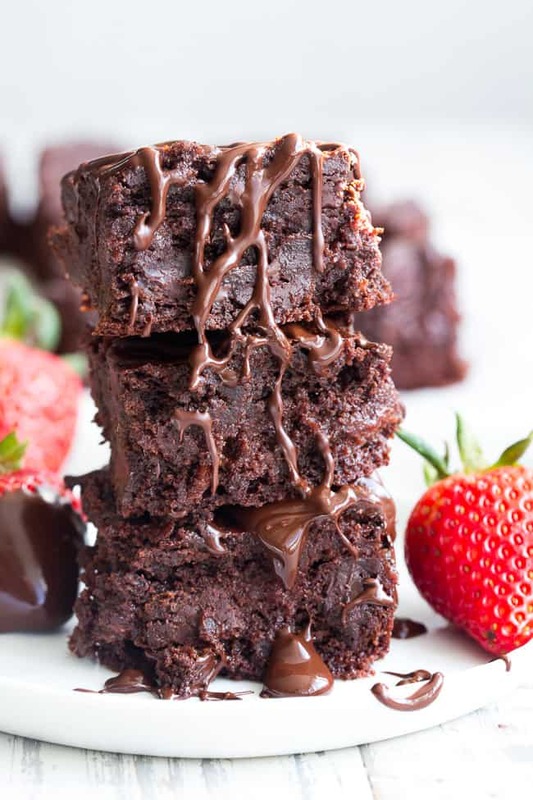 Fudgy chocolate brownies with chunks of dark chocolate and a sweet homemade strawberry filling?! Yes, yes, and oh yes. Plus a generous drizzle of melty dark chocolate on top of that? Even more yes. I won’t even start to mention ice cream (my favorite coconut vanilla) at this point – although if you want to I’ll definitely listen! I’ll start with the strawberry filling – since that’s what you’ll make first. It’s a spin-off of the filling for my almond butter & jelly cookie bars, and it’s the simplest way to make a gooey fruit filling that yes – the kids will find acceptable. All you need are strawberries and maple syrup. 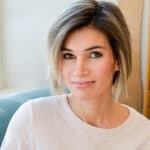 Fresh or frozen – it doesn’t matter! 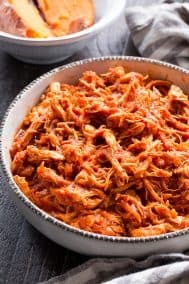 You simply boil the ingredients together and allow the sauce to reduce to a consistency similar to strawberry preserves. 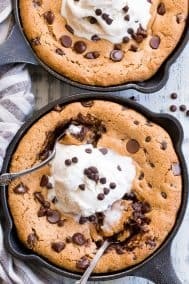 It bakes well and tastes incredible with all the fudgy dark chocolate flavor in the brownie batter! The brownie batter itself is super easy to mix together – just make sure all your ingredients are at room temp before mixing, since that will keep the coconut oil from starting to solidify. Since I almost NEVER remember to take my eggs out early, I just allow them to sit in hot water for a minute or so to quickly warm them up – works perfectly every time! For the dark chocolate in the brownie recipe, I actually made my own with the same recipe I used for the chocolate shell in my truffles. I usually allow it to chill in a parchment paper lined loaf pan, then chop as needed! You can also just use your favorite paleo (or any) dark chocolate you wish! 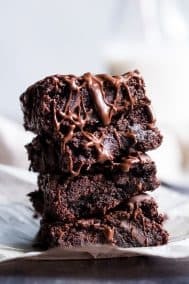 These brownies (and most paleo brownies in my opinion) are even more deliciously fudgy after chilling – but yes – I know it’s tough to wait for brownies to cool completely before digging in. Trust me though – you’ll have a MUCH easier time cutting these (and the texture will be perfect) if you allow the brownies to cool, and then chill in the fridge for about an hour. I like to store these covered in the refrigerator for about a week, and they can also be frozen and they thaw really well in the fridge overnight. 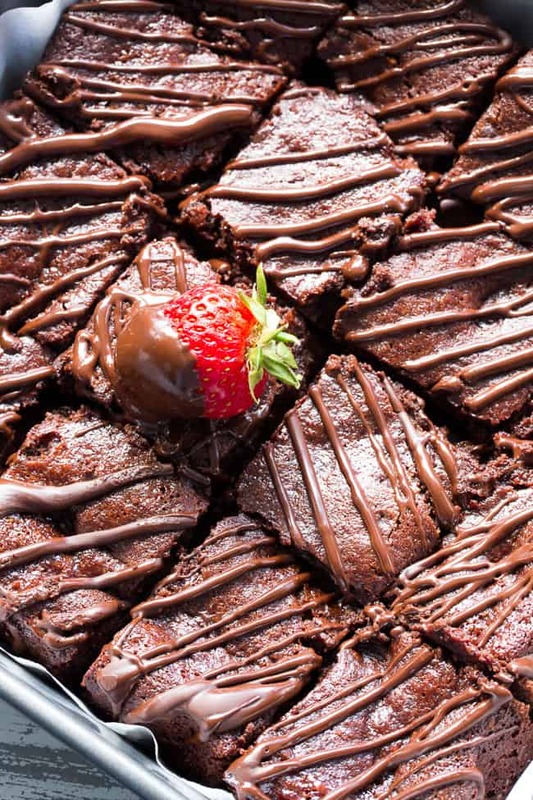 I can’t wait for you all to try these brownies – you’re in for a major treat! Whether you’re making them for a special occasion (like Valentine’s Day – which is 3 days from now!) or “just because” it’s time for chocolate – I know you’ll enjoy this healthier version of decadent, fudgy brownies. Get your apron on (because chocolate will kill your outfit) and let’s bake!! 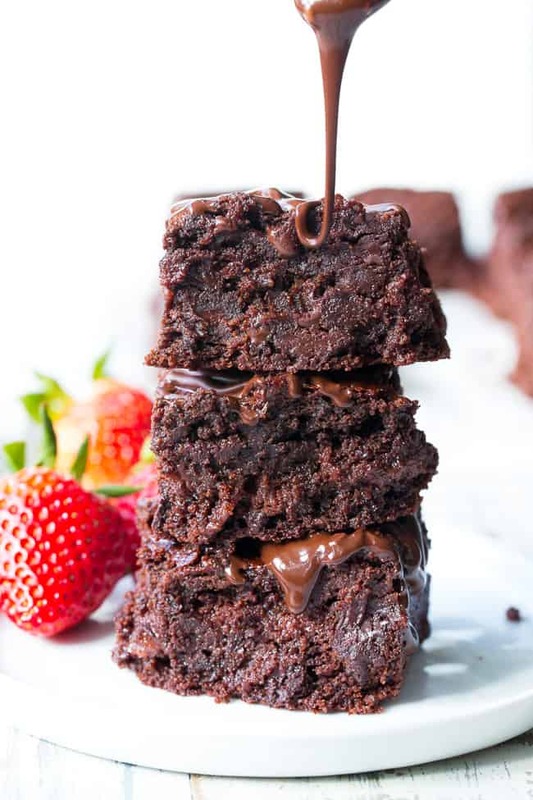 These fudgy paleo brownies are layered with easy homemade strawberry preserves and drizzled with more dark chocolate for the ultimate decadent (but healthy!) dessert. They're grain free, dairy free, gluten free with a refined sugar free option. Bring strawberries and maple to a boil in a small saucepan, stirring to prevent burning. Continue to simmer on med-low 20-30 minutes until thickened and reduced, stir occasionally and scrape sides of saucepan to prevent burning. Remove from heat and allow to cool completely, then chill until ready to use. 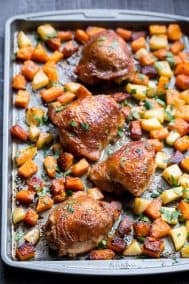 Line an 8 x 8 inch baking dish with parchment paper and preheat your oven to 350 degrees. In a separate bowl, combine the almond flour, cocoa powder, baking soda and salt. Carefully pour about 3/4 of the brownie batter into the lined baking dish, then pour all the strawberry filling (it should be about 2/3 cup) over the batter. Pour the remaining brownie batter over the top scraping the bowl with a spatula. 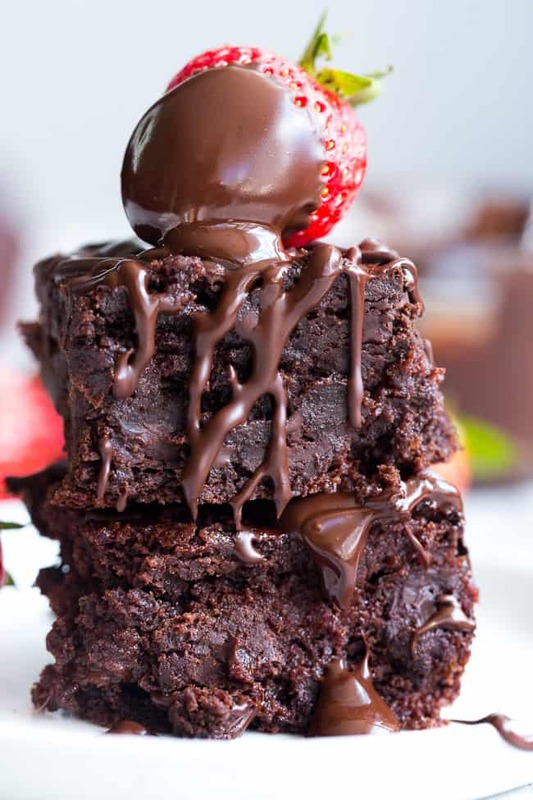 Then use the spatula to gently swirl the brownie batter with the strawberry. Bake in the preheated oven for 25 minutes or until the center is just set. Check after 20 mins to prevent overbaking! Remove from oven and allow to sit and cool on a wire rack for at least an hour, preferably 2, before cutting and serving. These can be stored covered in the refrigerator or at room temperature, depending your preference. 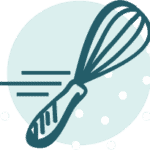 For chocolate drizzle, whisk all ingredients together well until a smooth mixture forms (consistency of melted chocolate). Drizzle over the top after brownies cool, before serving. *You can also drizzle a melted dark chocolate of your preference over the top for the same effect. Want More Paleo Brownies and Bars? Try One of These! Could you sub 2 chia eggs for eggs? If I don’t want to use coconut sugar, can I substitute for more maple syrup or honey? I just want to stare at that picture all day!!! Yum!!!! 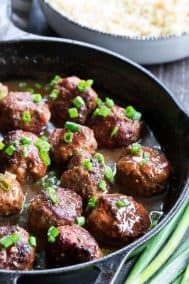 I plan on making these the next week, they look really delicious! 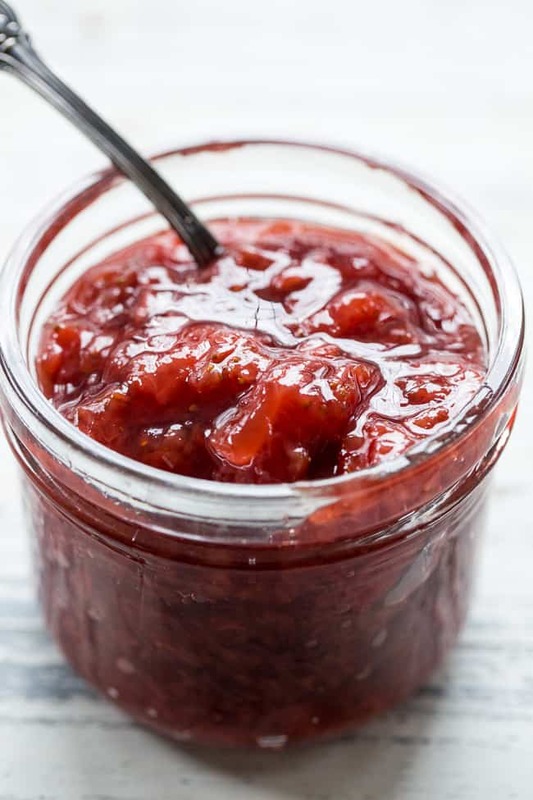 I have really yummy and sweet strawberry jam at home (made 100% from the berries, no added suga). Can you tell me how much should I use of it? Hi! I’d say about 2/3 cup 🙂 Enjoy! These may be the best brownies that I have EVER had in my entire life! Yay! Thrilled to hear you enjoyed them! I made them today and they are sooo yummy! Everyone loved them in my family. From now on I shall make my own chocolate at home! Aw I’m thrilled you enjoyed! Oh my goodness! Ended up making these and they are so so good!!! My husband thought they would be good with a cherry “preserve”. Like a chocolate covered cherry. I prefer strawberries but May try that next time. These are super sweet so I also may try to cut the sugar down some next time and see how it works. I can’t have gluten and I can honesty say these are better then any gluten, preservative loaded, refined sugar brownie I’ve ever had. Great job coming up with this one. And THANK YOU! These look so good! Do you think there would be a way to use an over ripe banana to cut down on the maple syrup needed? These were the most amazing brownies I’ve had since starting my diet 6 months ago! 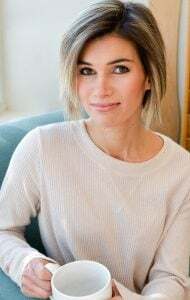 I started AIP and with introductions I am moving more towards Paleo. Thank you so much for sharing such a wonderful treat I could indulge in on my birthday! 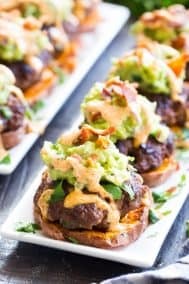 Just made these and they are amazing! I did drain a bit of the juice of the strawberry sauce because it seemed a little runny and I didn’t have time to wait around for it to cool. Also, for all who are wondering, I used Ghirardelli premium cocoa and it worked just fine! I did order a bag of that raw cacao because it seems a lot healthier but wanted to report that it works with regular cocoa as well. Thank you for the great recipe! Sounds delicious, glad you enjoyed! 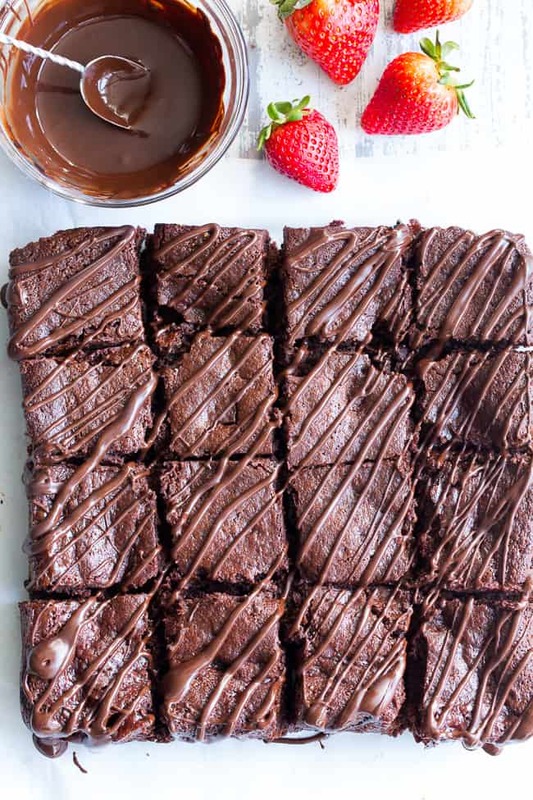 These brownies are so good! Just made them for Memorial Day and the whole family loved them! Very rich flavor. If I leave out the strawberry filling completely, would I need to do anything else differently? Would it affect cooking time? Should you chop the strawberries before you mix them with syrup then boil? If you want, but there’s no need since they’ll break down with cooking. 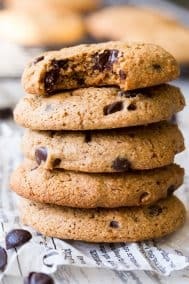 Can you use coconut cassava flour for these? 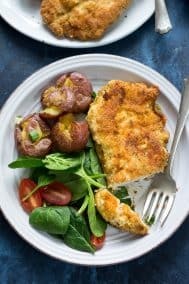 Is there anything that can be substituted for almond flour in this recipe for those with tree nut allergies? I don’t have blanched almond flour, only super fine natural. Is that ok? These look SO good! Can’t wait to celebrate Valentine’s Day with them for dessert! We have just started our AIP journey, so no nurs or eggs yet….do you have good substitutions for these?